(Phys.org) —One of the most powerful tools for understanding the formation and evolution of galaxies has been the use of computer simulations—numerical models of astrophysical processes run on supercomputers and compared with astronomical observations. Getting computer simulations to produce realistic-looking galaxies has been a challenge, however, and different codes (simulation programs) produce inconsistent results. Now, an international collaboration led by astrophysicists at the University of California, Santa Cruz, aims to resolve these issues through an ambitious multi-year project named AGORA (Assembling Galaxies of Resolved Anatomy). AGORA will run direct comparisons of different codes using a common set of initial conditions and astrophysical assumptions. Each code treats some aspects of the physics differently, especially the way that energy from stars and supernovas is fed back into the simulated galaxies. The simulations are being run at the best resolutions currently possible, and they are using the same input physics as much as possible. The simulation results will be systematically compared with each other and against a variety of observations using a common analysis and visualization tool. These comparisons will help researchers determine which of their simulation results are due to a particular code platform and which are due to the underlying theoretical assumptions common to all of the simulations. 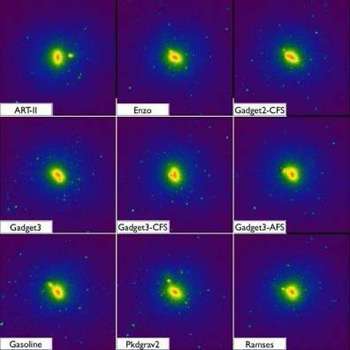 "The physics of galaxy formation is extremely complicated, and the range of lengths, masses, and timescales that need to be simulated is immense," explained Piero Madau, professor of astronomy and astrophysics at UCSC and co-chair of the AGORA steering committee. "You incorporate gravity, solve the equations of hydrodynamics, and include prescriptions for gas cooling, star formation, and energy injection from supernovae into the code. After months of number crunching on a powerful supercomputer, you look at the results and wonder if that is what nature is really doing or if some of the outcomes are actually artifacts of the particular numerical implementation you used." The AGORA project will explore the fundamental astrophysics of galaxy formation in the cosmological context of a "cold dark matter" universe. Although the nature of dark matter remains a mystery, it accounts for about 84 percent of the matter in the universe. As a result, the evolution of structure in the universe has been driven by the gravitational interactions of dark matter ("dark" because it can't be seen, and "cold" because the particles are moving slowly). The ordinary matter that forms stars and planets has fallen into the "gravitational wells" created by clumps of dark matter, giving rise to galaxies in the centers of dark matter halos. The project's first major task will be to model a realistic isolated disk galaxy using various codes and their feedback recipes, varying both the feedback parameters and the resolution. The second task will be to compare the codes in cosmological simulations. Specifically, all the participating codes will model the evolution of eight individual galaxies from the big bang to the present, resulting in final masses representing a range of galaxy sizes, from that of a dwarf galaxy to one more massive than the Milky Way. For each mass, one set of simulations would model a galaxy having a quiescent merger history (having few mergers with another galaxy its own size) and another would model a galaxy having a violent merger history with many major mergers. The final task will be to compare the results, including such observable characteristics as the shape, internal structure and velocities, and spectral energy distribution (distribution of light at different wavelengths) between simulations and with observations of real galaxies. The AGORA project will take advantage of new infrastructure for computational astrophysics at UC Santa Cruz, including the "Hyades" supercomputer and a high-capacity data storage system. "Our ability to store and analyze the data here, and make the output of the simulations available to the community at large, has made it possible for us to set up such a large project," Madau said. The project was initiated in a workshop at UCSC in August 2012, under the sponsorship of the University of California High-Performance AstroComputing Center (UC-HiPACC). A second workshop was held at UCSC a year later. The project now involves more than 90 astrophysicists from 45 institutions in eight nations. A paper describing the project in detail has been accepted for publication in the Astrophysical Journal Supplement. The first author is Ji-hoon Kim, formerly a postdoctoral researcher at UCSC and now at CalTech, who is coordinating the project along with the steering committee led by Madau and Joel Primack, a professor of physics at UCSC and director of the UC-HiPACC. Other members of the AGORA steering committee are Tom Abel (Stanford), Nick Gnedin (Fermilab and University of Chicago), Lucio Mayer and Romain Teyssier (University of Zurich), and James Wadsley (McMaster University, Canada). AGORA is not the first such comparison of supercomputer simulations of galaxy evolution, but it is the most comprehensive and the highest-resolution (finest detail). Previous astronomical simulation comparison studies were the Santa Barbara Cluster comparison project (1999) and the Aquila comparison project (2012). The AGORA project is an open collaboration and welcomes new participants. 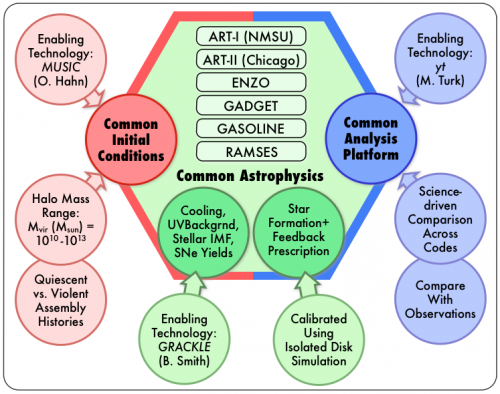 AGORA is making all of its initial conditions and common assumptions public, both to make it easy for astrophysicists to join the collaboration and also to raise the level of galaxy simulations worldwide. "This project will tell us what are the key ingredients that produce realistic galaxies regardless of the numerical codes. It will also challenge the community to put more effort in cross-checking their results against others'," Kim said. More information: More information about AGORA is available in the paper, "The AGORA High-Resolution Galaxy Simulations Comparison Project," preprint available at arxiv.org/abs/1308.2669 . The official AGORA website is at www.agorasimulations.org.